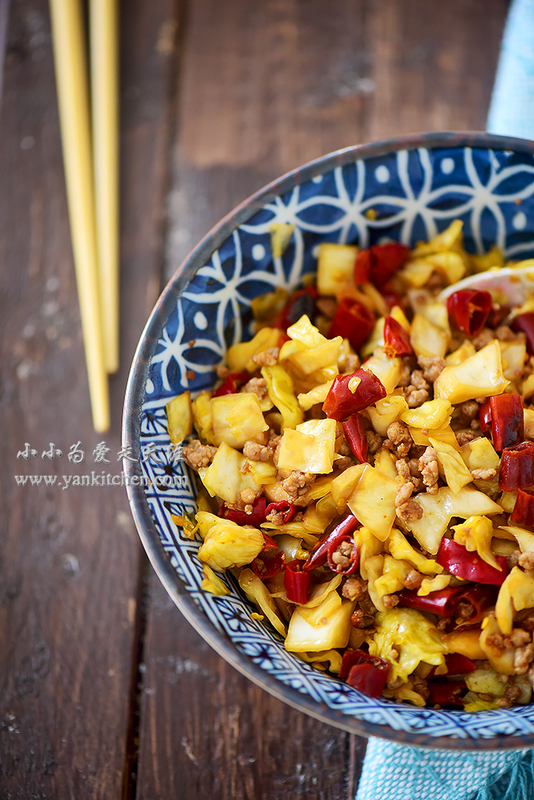 Sichuan pickled vegetable is comfort food for a lot of Chinese people. It is also the key and soul in Sichuan cuisine. I learned how to make Sichuan pickled vegetable years ago. But I haven’t been quite successful until I brought back a Sichuan style pickle jar from my last trip back to China. Dice the pickled cabbage, pickled chilies and dried chilies. Peel and slice the garlic. Heat a wok over high heat. Add oil, garlic, Sichuan peppercorns, dried chilies and pickled chilies. Sautee for a minute, add minced pork, black pepper, cooking wine and soy sauce. Stir fry them over high heat until the pork is golden brown. It is time to add diced pickled cabbage, sugar and salt. Stir fry everything together on high heat for 2 to 3 minutes; remove from heat and serve immediately.